PRICE INCLUDES: a color chart and color key listing DMC floss colors; a color image showing the finished piece framed; a large, easy-to-follow black and white chart with symbols and a black and white key; and a few framing tips. An antique appearance results from using tea-dyed Irish linen. 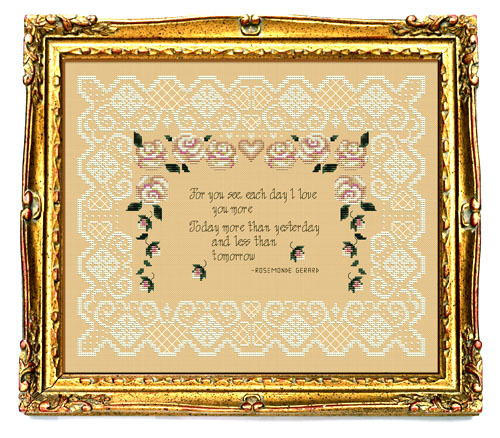 The lace design is pale yellow and frames these words attributed to Rosemonde Gerard: “For you see, each day I love you more Today more than yesterday and less than tomorrow” Best for the stitcher with experience. Frame not included.